Having access to the massive amount of data that is generated by surveillance cameras and security systems is only part of the equation; understanding and reacting to that data is the most effective way to keep employees, visitors, and assets protected. exacqVision 9.6 allows users to harness the power of their data with reporting capabilities that provide unprecedented event insight. The latest version also provides important new features and integrations that ensure continuous surveillance and an even more intuitive user experience. exacqVision now integrates with DMP intrusion panels, giving users more options to build their complete security solution. By leveraging this powerful integration, users can arm, disarm, and bypass zones and partitions from the exacqVision client, as well as use DMP alarms to trigger other events within exacqVision. The ability to seamlessly execute arm/disarm actions vs. simply receiving alarm system events is an important distinction from other VMS systems’ intrusion integrations, and allows customers to better protect their businesses. exacqVision 9.6 now supports direct SD video recording capabilities with Axis cameras, minimizing lost video due to unexpected network or NVR outage. With this feature enabled in Axis cameras, motion events are always recording to the SD card. If connection is lost between the camera and NVR, the video that was recorded during that time will transfer back to the exacqVision NVR upon reconnection and is automatically stored at the correct date and time. This offers peace of mind to customers who use one of the industry’s most popular camera lines to maintain a safe and compliant work environment. 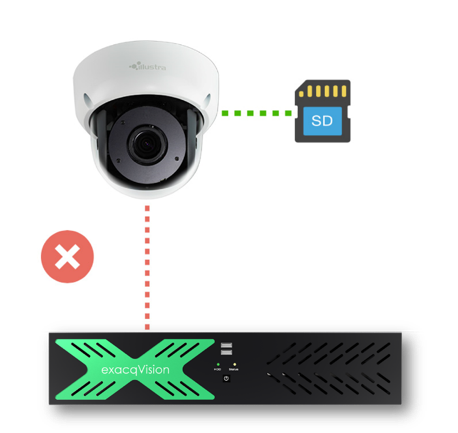 The growing complexity and interconnectivity of security systems has driven the need for more secure communication between cameras and video servers, and exacqVision 9.6 now offers an optional feature to encrypt the video streams from Axis and Samsung cameras to the video server. Encrypting the video stream ensures data can only be interpreted by the server itself, meaning any third-party that intercepts this stream is unable to decrypt or make use of this data in any way. This additional layer of security offers the cyber protection necessary to keep a customer’s system continually secured. Already known to be an intuitive VMS, exacqVision 9.6 further simplifies the experience by allowing users to specify the language they want the exacqVision Client to display in, as well as easily switch languages without requiring complicated changes to the computer settings. Not only does this eliminate tedious and error-prone processes for the user, it simplifies region-specific installation and support for integrators. Today’s networked video surveillance systems face risks in many ways: from nefarious hackers focused on creating massive Distributed Denial of Service (DDoS) attacks, but also from the more innocuous practice of poor password management. With Cybersecurity top of mind, exacqVision 9.4 offers additional protections to safeguard against threats to video management systems. exacqVision supports innovative technology with Illustra IP cameras, to provide camera-NVR connectivity that protects against video loss. When connectivity between Illustra cameras and an exacqVision NVR fails, video records directly onto the camera’s SD card. Once connectivity is reestablished, recorded video trickles back to the exacqVision NVR and is automatically stored at the correct date and time. Out of sight, out of mind. This is definitely not a phrase that has any place in a business focused on the safety and well-being of its people and critical assets. That’s why we’ve created a lockdown mode for the exacqVision Event Monitor which ensures important notifications can’t be missed by closing the event monitor and are immediately seen by system users so appropriate action can be taken. Proper password management isn’t always intuitive, and sometimes password tools and policies are necessary to enforce best practices for creating and protecting passwords. Each exacqVision release includes stronger cyber protections to safeguard your video ecosystem. As of exacqVision 9.4, users will be required to change the admin password on all new software installations, eliminating default passwords for the admin account. This will help prevent unauthorized access to the VMS and keep data safe and your company’s reputation intact. Analysts estimate that some 50% of people on the Internet are still using the same password or an easily guessed, common password for all of their logins. These are some of the riskiest things you can do online, and certainly perilous for anyone managing a video security system. Cyber-attackers routinely use brute force attack programs to rapidly try hundreds or even thousands of common passwords to gain access to a system. To help protect the system from brute force attacks, exacqVision 9.4 introduces a mechanism that requires users to select a password that is harder for a computer algorithm to guess. Preventing users from choosing common passwords ensures the system is kept safe from unauthorized access. Exacq has always prevented passwords from appearing as plain text in its configuration files, but exacqVision 9.4 introduces a more secure way to store passwords in these files. Passwords are now stored using a secure, machine-specific algorithm. This means that even if an attacker is able to break the algorithm and figure out a user’s password, he or she will only gain access to one set of credentials, as each file uses its own algorithm. ESM has always allowed you to assign different privileges for a particular user to individual ESM groups. However, manually assigning these privileges to each of the groups available was often time-consuming and prone to error. The latest release of ESM automatically propagates a user’s server privileges to all the child groups of a parent group. For example, if a user is assigned “Live Only” access in parent group B, those privileges can be automatically propagated to all child groups of that parent group. This saves a significant amount of admin time and greatly reduces the chance of data entry error. Until now, the ESM installer has only been available in the 32-bit version, which limited the utilization of hardware capabilities. Today’s 5.8 release allows you to fully utilize the 64-bit processor and higher memory capacity of performance-built servers. The release has been verified on a wide range of operating systems, including the latest Windows Server 2016 and newest Ubuntu 18.04. Existing users can easily upgrade from a 32-bit software with the installer doing all the heavy lifting in the background for a seamless transition. This latest release contains several security related enhancements and preventative safeguards designed to keep the software safe from external threats. Starting with this release, the installer will not have a default password for the admin user and, instead, will require the password be set at install time. This step not only prevents an inadvertent open door to the system, but also averts brute force attacks by enforcing password complexity rules. Other enhancements include better protection of user session information, and the prevention of unintended execution of programs and cross-site scripting attacks, all painstakingly designed to mitigate attacks and security vulnerabilities. ESM users frequently integrate with LDAP or Active Directory to simplify user management – importing users from existing directories and allowing centralized authorization in an Enterprise setting. The latest release improves the integration by caching results and optimizing queries, resulting in accelerated browsing of huge LDAP directories and a vastly improved user experience. 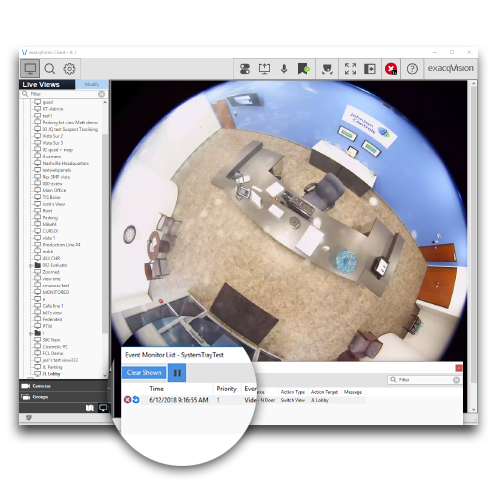 exacqVision 9.4 introduces enhancements to our ONVIF plugin which improves video quality and reduces camera jitter. These changes provide end users with enhanced and uniform time-stamping capabilities for video, audio, and metadata on both the server and camera, leading to a much smoother user experience.